Introduction Up to half of all smokers develop clinically significant chronic obstructive pulmonary disease (COPD). Gaps exist in the implementation and uptake of evidence-based guidelines for managing COPD in primary care. We describe the methodology of a cluster randomised controlled trial (cRCT) evaluating the efficacy and cost-effectiveness of an interdisciplinary model of care aimed at reducing the burden of smoking and COPD in Australian primary care settings. Methods and analysis A cRCT is being undertaken to evaluate an interdisciplinary model of care (RADICALS — Review of Airway Dysfunction and Interdisciplinary Community-based care of Adult Long-term Smokers). General practice clinics across Melbourne, Australia, are identified and randomised to the intervention group (RADICALS) or usual care. Patients who are current or ex-smokers, of at least 10 pack years, including those with an existing diagnosis of COPD, are being recruited to identify 280 participants with a spirometry-confirmed diagnosis of COPD. Handheld lung function devices are being used to facilitate case-finding. RADICALS includes individualised smoking cessation support, home-based pulmonary rehabilitation and home medicines review. Patients at control group sites receive usual care and Quitline referral, as appropriate. Follow-ups occur at 6 and 12 months from baseline to assess changes in quality of life, abstinence rates, health resource utilisation, symptom severity and lung function. The primary outcome is change in St George’s Respiratory Questionnaire score of patients with COPD at 6 months from baseline. Ethics and dissemination This project has been approved by the Monash University Human Research Ethics Committee and La Trobe University Human Ethics Committee (CF14/1018 – 2014000433). Results of the study will be disseminated in peer-reviewed journals and research conferences. If the intervention is successful, the RADICALS programme could potentially be integrated into general practices across Australia and sustained over time. Trial registration number ACTRN12614001155684; Pre-results. A large implementation trial in primary care involving current smokers, ex-smokers and patients with an existing diagnosis of chronic obstructive pulmonary disease. Cluster randomisation of general practices to minimise the risk of contamination, and blinded outcome assessment. Open-labelled trial; participants and health professionals are not blinded, with a potential for Hawthorne effect. Optimal pharmacological treatment is important in controlling the symptoms of COPD and preventing exacerbations. Deviations from recommended pharmacological treatments have been identified, especially in relation to use of corticosteroids (inhaled and oral) and antibiotics.21 30 In recent years, multiple new therapeutic agents for managing COPD have been introduced onto the Australian market. These agents include new long-acting muscarinic antagonists (LAMAs), inhaled corticosteroid/long-acting beta agonist (LABA) combinations and LAMA/LABA combinations. New inhaler devices have also been developed for the delivery of these novel agents, creating additional challenges for health professionals and patients alike. Currently, delivery of pulmonary rehabilitation programmes and HMRs is on a GP referral basis. Remuneration is available to pharmacists for HMR services (home visit and generation of a report of findings and recommendations to the referring practitioner) through the MBS. However, there is no remuneration pathway for private physiotherapists providing pulmonary rehabilitation programmes in the community. A formal model of care bringing together services provided by various health professionals for the management of patients with COPD is lacking. An interdisciplinary model of care involving GPs and other practice staff, pharmacists and physiotherapists has not been evaluated in the Australian primary care setting. The primary aim of this study is to determine the efficacy, for patients with COPD, of an interdisciplinary model of care (RADICALS — Review of Airway Dysfunction and Interdisciplinary Community-based care of Adult Long-term Smokers) compared with usual care on health-related quality of life (HRQoL), measured at 6 months using the St George’s Respiratory Questionnaire (SGRQ). The secondary objectives are to determine the proportion of smokers with spirometry-confirmed COPD and evaluate the efficacy of RADICALS compared with usual care on smoking abstinence, nicotine dependence, lung function, symptom severity, health resource utilisation (unplanned GP visits, hospitalisations and emergency department presentations), anxiety and depression scores, and medication adherence at 6 and 12 months. If the interdisciplinary model is shown to be effective, an economic evaluation will be conducted to compare the costs and benefits of the model with usual care. This is a cluster randomised controlled trial in primary care clinics across Melbourne, Australia. Eligible primary care clinics that consent are randomised to either intervention (interdisciplinary care group=ICG) or control (usual care group=UCG). Participants are recruited from each clinic and receive the intervention or usual care depending on the allocation of the clinic. Each participant is screened for eligibility at baseline and completes follow-up interviews at 6 and 12 months from baseline. The RADICALS intervention is delivered to participants from ICG clinics (see figure 1). RADICALS study flow diagram. COPD, chronic obstructive pulmonary disease; GP, general practitioner. Eligible practices are identified through advertisements and consultation with the Eastern Melbourne PHN and key informants. Direct approaches to clinics (telephone contact, direct emails with study information, brief presentations at GP continuing professional development events, door knocking and so on) may also be employed. The practice is formally enrolled into the study upon receipt of a signed practice agreement form. Group or solo primary care practices with at least 1000 patients in their databases are eligible for inclusion in the trial. Primary care practices must also be willing to accommodate research staff at the practice or have personnel at the practice willing to undertake training and dedicate time to specific tasks of the research project. Eligible patient participants are identified through searching of the practice clinical database by an RA employed at each site or trained practice staff. Practice staff are also informed of the study and asked to refer patients who meet eligibility criteria. Letters with an Expression of Interest form are sent from the practice to eligible patients formally inviting them to take part in the study. Those interested in the study are asked to return the completed form in a reply-paid envelope. Non-respondents are sent up to two reminders. Informed consent is sought after provision of study information, a plain language statement and opportunities for any questions. A toll-free number is set up and is available to potential participants for this purpose. Baseline data are collected after written informed consent is obtained. Current or ex-smokers with a history of at least 10 pack years of smoking, aged 40 years or older, including those with an existing diagnosis of COPD, who had two or more visits to the practice in the previous 12 months, are included. Two or more visits will indicate patient engagement with the practice. Those with no history of smoking are eligible only if they have spirometry-confirmed COPD. Exclusion criteria include patients with a terminal illness (anticipated survival <12 months), those unable to provide informed consent (eg, cognitive impairment), those with pre-existing interstitial lung disease, unstable cardiovascular status, comorbidities preventing participation in an exercise training programme or contraindications to spirometry (including abdominal/thoracic/neurosurgery/ocular surgery in the preceding 6 weeks, pneumothorax in the preceding 6 weeks, haemoptysis of unknown origin, open pulmonary tuberculosis, thoracic/abdominal/cerebral aneurysms, angiogram in the previous 24 hours, recent pulmonary embolus and others listed in the American Thoracic Society/European Respiratory Society (ATS/ERS) guidelines46). Those patients who have completed a pulmonary rehabilitation programme in the previous 24 months are also excluded from the study. All participants recruited from a clinic receive the intervention or usual care depending on the allocation of the clinic (ie, whether the clinic is allocated to ICG or UCG). Case-finding occurs in patients using the handheld COPD-6 device (Vitalograph, Ennis, Ireland). If COPD is suspected during the initial testing (ie, forced expiratory volume in 1 second (FEV1)/forced expiratory volume in 6 seconds (FEV6)<0.7522 47) or if the participant has difficulty using the handheld device, spirometry is performed. Spirometry testing is performed by trained RAs using Easy on-PC spirometers (ndd Medizintechnik AG, Zürich, Switzerland), following the ATS/ERS guidelines.46 Pre-bronchodilator and post-bronchodilator spirometry are performed by participants at baseline. Readings are interpreted using an algorithm. Participants with post-bronchodilator FEV1/ forced vital capacity (FVC) readings<0.7 are defined as having COPD. Results are communicated to the participant’s clinic, where diagnosis is confirmed after taking patient symptoms and risk factors into consideration. Those with an existing diagnosis of COPD undergo testing to confirm their diagnosis, where appropriate. If the participant already had spirometry in the previous 3 months, that report is used for confirmation of diagnosis. Assistance from respiratory scientists and/or respiratory physicians is available for the interpretation of challenging reports. Participants in ICG clinics receive the RADICALS model of care. The key components of RADICALS include intensive, individualised smoking cessation support from the RA, home-based pulmonary rehabilitation from a specifically trained physiotherapist and a home medicines review from a consultant pharmacist (accredited to undertake medication reviews). The intervention is coordinated by the RA at each site under the supervision of each participant’s GP and clinic staff. Participants are free to decline or discontinue any or all of the intervention components at any point in time; reasons for declining or discontinuing are obtained where possible. In addition, patients with a diagnosis of COPD receive the LFA booklet ‘Better Living with Chronic Obstructive Pulmonary Disease – A Patient Guide’ 49 and management by their GP according to the COPD-X Plan. Individualised smoking cessation support is coordinated by the RA at each site and offered to participants who are current smokers, regardless of COPD diagnosis. In ICG clinics, the consultant pharmacist performing HMRs is also involved in providing smoking cessation support for smokers who have COPD. The intervention(s) offered will be individually tailored to the patient’s smoking status, needs and preferences. QUIT resources and a treatment algorithm50 are used to guide treatment. Pharmacotherapy (over-the-counter and/or prescription) is recommended, if appropriate. If prescription medications are required to assist smoking cessation, these are discussed with the participant’s GP. Smoking cessation support is offered at an initial consultation, with follow-up phone calls at 1 week and 1 month from the initial consultation, as appropriate. Telephone follow-ups re-emphasise the importance of quitting and long-term abstinence, and also discuss issues surrounding relapse and relapse prevention strategies. A home-based pulmonary rehabilitation model is employed,51 delivered by a specifically trained physiotherapist. The model includes one home visit with weekly follow-up telephone calls using a motivational interviewing approach to build confidence and set goals. Home-based exercise training is prescribed based on each patient’s exercise capacity. A goal for walking distance is set and distance is recorded using a pedometer. Participants are encouraged to exercise for 30 min, five times per week, and to record the completion of this activity in a home diary. Resistance training for the arms and legs uses daily activities and equipment that is readily available in the home environment (eg, step-ups on an internal or external step, sit to stand from a standard height chair, water bottles for upper limb weights). Participants are contacted by a physiotherapist each week by telephone for 7 weeks. During the weekly telephone calls, disease-specific self-management training and exercise progression are achieved using the principles of motivational interviewing. Exercise goals and health goals are discussed and documented each week in the home diary. The physiotherapist also refers to the LFA ‘Better Living with Chronic Obstructive Pulmonary Disease – A Patient Guide’ 49 booklet during discussions. A home medicines review52 from a consultant pharmacist identifies any medication-related problems and deviations from COPD-X treatment guidelines. The consultant pharmacist interviews participants at their homes and assesses their medication use, including inhaler technique. Interventions for optimising medication adherence and inhaler use are also offered, if required. The pharmacist generates a report for the GP, including recommendations for optimising medication use and adherence to COPD-X. GPs in UCG practices continue to provide routine care to their patients. GPs in these practices receive a copy of the COPD-X Plan and the ‘Supporting Smoking Cessation: a guide for health professionals’ 48 publication. Patient participants in UCG practices receive routine care from their GP and Quitline referral, if appropriate. Those identified to have COPD receive a copy of the LFA ‘Better Living with Chronic Obstructive Pulmonary Disease – A Patient Guide’ 49 booklet. Baseline data from each practice are collected at the time of clinic enrolment. General information on practice staffing and specialist services provided (including respiratory services provision) is obtained from the practice manager and/or practice staff using a standard data collection form. Data collection from participants occurs at baseline (time of recruitment) and at two follow-up time points: 6 and 12 months from baseline. Baseline data collection occurs through a face-to-face interview with participants at the clinic of recruitment. Telephone, mail or face-to-face follow-up is conducted to retain as many participants in the trial as possible and reduce the amount of missing data. Information on reason(s) for withdrawal from the study are obtained where possible. Patient demographics such as age, gender, nationality, language, education, employment, marital status, income, living arrangements, concession card status (ie, eligibility for reduced out-of-pocket cost of healthcare services and less expensive medicines) and healthcare visits in the past 6 months are collected at baseline. Patients’ medical records are reviewed to obtain medical and medication history. Smoking-related information is collected, including smoking status, age at which smoking started, smoking-related behaviours of participants and those of friends and housemates, money spent on cigarettes, and information on previous smoking cessation attempts and outcomes. Preferred methods of smoking cessation, motivation and confidence to give up smoking are also determined. The Charlson Comorbidity Index is used to collect information on comorbidities.53 Exhaled carbon monoxide (CO) levels are measured using a handheld piCO Smokerlyzer (Bedfont Scientific, Maidstone, Kent, UK) to confirm self-report of abstinence. COPD-6 (Vitalograph, Ennis, Ireland) readings are obtained as part of case-finding. Pre-bronchodilator and post-bronchodilator spirometry are performed at baseline, and post-bronchodilator spirometry is performed in patients with COPD at 6-month and 12-month follow-ups. Heaviness of Smoking Index (HSI)54: This is a two-item scale measuring nicotine dependence based on the number of cigarettes smoked per day and time to first cigarette of the day. A score of 1–2 indicates very low nicotine dependence and a score >5 indicates high nicotine dependence. Smoking Self-Efficacy Scale55: This is a nine-item scale that assesses confidence in the ability to abstain from smoking in certain high-risk situations. A 5-point scale ranging from ‘Not at all tempted’ to ‘Extremely tempted’ is used to answer questions about temptation to smoke in various situations. A higher score suggests greater temptation to smoke. Readiness to Quit Ladder (adapted)56 57: This scale has 10 response options that assess motivation to quit smoking along a continuum. Responses range from ‘Not considering quitting in the near future’ to ‘Have already quit smoking’. A higher score suggests greater motivation to quit smoking. Hospital Anxiety and Depression Scale (HADS)58: This is a 14-item questionnaire developed to screen for the presence of anxiety and depression. Visual Analogue Scales (VAS) for motivation and confidence: 10-point scales are used to assess participants’ motivation and confidence to give up smoking. SGRQ59: This is a 50-item questionnaire developed to measure health status (quality of life) in patients with diseases of airways obstruction. Questions are answered on three domains: symptoms (frequency and severity), activities that cause or are limited by breathlessness, and impact (on social functioning, psychological disturbances). Scores range from 0 to 100, with higher scores indicating worse HRQoL. COPD Assessment Test (CAT)60: This is an eight-item questionnaire used to measure the health status of patients with COPD. Each item is formatted as a semantic 6-point differential scale (0–5) with contrasting adjectives. All items can be scored as a single scale ranging from 0 to 40. Higher scores indicate worse health. Modified Medical Research Council (mMRC) Dyspnoea Scale61 62: This is a scale consisting of five statements describing levels of dyspnoea based on the extent to which various physical activities precipitate breathlessness. Each statement corresponds to a grade; grade 0 indicates no dyspnoea and grade 4 indicates severe dyspnoea to the point of almost incapacity. EQ-5D63: This is a generic instrument used as a measure of health outcome. This instrument obtains information across the five dimensions of mobility, self-care, usual activities, pain/discomfort and anxiety/depression. Each dimension is scored on a 5-point Likert scale (no problems/slight problems/moderate problems/severe problems/extreme problems). The EQ-VAS, a visual analogue scale contained within the EQ-5D questionnaire for recording an individual’s rating of their current HRQoL state, is also administered. Beliefs and Behaviour Questionnaire (BBQ)64: This 30-item questionnaire measures beliefs, experiences and adherent behaviour on 5-point Likert scales. Medication adherence will be assessed using the TABS (Tool for Adherence Behaviour and Screening) questionnaire, a subscale within the BBQ. Participants who receive the HMR are asked to complete an anonymous satisfaction questionnaire, adapted from surveys used in previous studies.65–68 GP feedback on each HMR conducted is also sought by asking them to complete a questionnaire when they receive the report from the consultant pharmacist. Data from participants will be stored in locked filing cabinets at the practices or at Monash University. Collected data will be de-identified, entered into an electronic database and saved on a password-protected computer. Data will be stored under these conditions for the duration of the trial and for the required time period after trial end, as stipulated by the Monash University regulations. Only investigators and research staff involved in the trial will have access to participant data. An independent data and safety monitoring board (DSMB) has been set up comprising a respiratory consultant with experience in development of clinical guidelines for management of COPD and clinical research; a physiotherapist with expertise in translation of research evidence into clinical practice, especially pulmonary rehabilitation; and a GP with experience in conducting clinical studies in primary care and reviewing the evidence base for treatment in respiratory diseases. The DSMB will meet periodically and as required to evaluate study progress, including patient accrual and retention, and review cumulative study data to evaluate safety, study conduct, and scientific validity and integrity of the trial. The DSMB will also provide independent advice to the investigators whether the study should continue without change, be modified or terminated. All outcome measure assessments are conducted by RAs blinded to treatment allocation. All possible measures are taken to prevent revealing treatment allocation to RAs conducting these assessments. The primary endpoint is change in HRQoL, as measured by the SGRQ, at 6 months from baseline. The SGRQ is extensively used in interventional studies involving patients with all COPD severities. The use of the SGRQ enables capturing of HRQoL effects of the RADICALS intervention across the spectrum of COPD severity. patient satisfaction with the home medicines review and GP feedback on home medicines review based on completion of standard surveys. Change in SGRQ score at 6 months from enrolment is the primary efficacy endpoint. A difference of at least four points between treatment arms is considered clinically significant.59 Assuming a conservative SD of 10 points,59 99 participants per group (80% power and p=0.05) will be required. Adjusting for clustering by practice (intraclass correlation=0.0169 and cluster size 10), the required sample is 108 per arm. To allow for 20% attrition after enrolment, recruitment will continue until 280 (140 in each arm) participants are enrolled in the trial. Therefore, at least 28 primary care practices need to be recruited and 14 each randomised to ICG and UCG. From each practice, 50 smokers will be screened to identify 10 with COPD (post-bronchodilator FEV1/FVC<0.7).70 A sample of 1400 smokers would allow the proportion of patients with COPD to be estimated within ±2% (approximately), with a 95% CI from 18% to 22%. Recruitment of 700 smokers in each arm would allow a difference of 6% in abstinence rates to be detected (eg, 12% in control vs 18% in intervention) with 86% power at the 5% level of significance. Baseline demographic and clinical characteristics will be summarised using proportions, means and SD, or medians and IQRs, as appropriate. Changes in study variables within the intervention and control practices will be examined and any differences in outcomes between the two groups will be compared. Unadjusted and adjusted analyses will be performed with analysis by COPD status (existing or no existing COPD diagnosis) as a covariate and an interaction of the intervention with this covariate. The mean change in SGRQ scores at 6 months in each treatment group will be estimated. Differences between groups and 95% CIs will be determined. Multivariable analyses will be performed using multiple linear regression for continuous outcomes and multiple logistic regression for binary outcomes. All regression analyses will be adjusted for clustering, prognostic variables and potential confounders. Data will be analysed using the intention-to-treat principle. Sensitivity analyses using multiple imputation methods may be performed to account for missing data. Sensitivity analysis using different exhaled CO cut-off values (3-10ppm) will be performed. Participants who are lost to follow-up will be regarded as smokers (ie, deemed to have relapsed smoking at that point). Per-protocol analysis will also be undertaken. Economic evaluation of health interventions is important in aiding decision-making processes, especially in matters of government reimbursement.71 Various costing information will be collected as part of the trial. Direct costs of the intervention will include staff time, consumables, communications, overheads and staff transportation. Information on the cost of the intervention will be collected by staff within the trial. Medicare Benefits Scheme and Pharmaceutical Benefits Scheme data may also be used to assign costs to intervention components. Data on the use of health services including GP, specialist and emergency department visits, and hospitalisations will be collected from patients, and the associated costs with the use of these will be considered for evaluation. The EQ-5D will be used to classify health states and determine an individual’s utility of health state. Quality-adjusted life years (QALYs), which can capture the impact on both quantity and quality of life (ie, mortality and morbidity),72 will be generated using utility weights outlined in previous literature.71 An incremental cost-effectiveness ratio will be used to compare the differences in costs and differences in gains in QALYs between the intervention and usual care. Other outcomes considered for economic analysis may include change in SGRQ scores and change in number of individuals abstaining from smoking. The trial is in the recruitment phase at the time of manuscript submission. The first participant was enrolled on 5 March 2015. End of data collection is expected in April 2018. Diagnosis and management of COPD are suboptimal in Australian primary care despite the availability of evidence-based treatment guidelines. Effective interventions are required for case-finding and diagnosis of COPD, maintaining and improving HRQoL, promoting self-management and improving participation in exercise programmes. Studies involving multidisciplinary, integrated care models have signposted various issues that should be addressed in future studies for better COPD management. These include better patient involvement, more individualised and intensive smoking cessation interventions, new ways of delivering pulmonary rehabilitation, and prompt intervention following COPD diagnosis.24 40 42 The RADICALS model of care aims to address these aspects. The model emphasises an interdisciplinary approach to COPD management by providing patient-centred care through collaborative working relationships between GPs, nursing staff, other practice staff, pharmacists, physiotherapists and respiratory physicians/scientists. Individualised smoking cessation support, HMRs, home-based pulmonary rehabilitation and interdisciplinary care are the key components of RADICALS. HMRs can identify existing medication-related problems and make recommendations regarding COPD and smoking cessation therapy. Medication reviews have the potential to improve adherence to evidence-based pharmacological treatments for COPD. A home-based pulmonary rehabilitation programme is known to be as effective as centre-based pulmonary rehabilitation.51 Home-based pulmonary rehabilitation may overcome some of the barriers associated with centre-based rehabilitation, such as inconvenience of travel and long waiting periods. The proposed RADICALS model has the potential to reduce the burden and morbidity associated with smoking and COPD, and improve HRQoL for affected patients. If the intervention is successful, the RADICALS programme could potentially be integrated into general practices across Australia and sustained over time. Resources and services already exist in the Australian community that would aid its implementation. It should be noted that the HMR service and the home-based pulmonary rehabilitation programme offered as part of RADICALS are funded solely through the trial, and not through the MBS. Outcomes of this study may inform integration of this service model into primary care, including service payments through the MBS. Our case-finding methods are informed by a previous COPD case-finding study conducted in Australian primary care,47 and the LFA recommendations for case-finding based on FEV1/FEV6 readings,22 potentially adding to the evidence base in this area. Our study is a large implementation trial in primary care involving current smokers, ex-smokers and patients with an existing diagnosis of COPD. Some strengths include the cluster randomisation of general practices, which minimises the risk of contamination, and outcome assessment by staff blinded to treatment allocation. Due to the nature of the intervention, blinding of participants and health professionals is not possible, introducing the potential for Hawthorne effect. The RADICALS intervention is primarily designed for Australian primary care based on the COPD-X guidelines, which do not use the GOLD ABCD grading system for symptoms, potentially limiting extrapolation of our findings to studies using the ABCD grading. Nevertheless, we use the mMRC Dyspnoea Scale and the CAT for symptom assessment in participants, allowing us to carry out subgroup analyses, if required. Moreover, the ABCD assessment tool performed no better than the spirometric grades for mortality prediction or other important health outcomes in COPD.73–75 Using an FEV1/FEV6 cut-off of 0.75 may result in over-referral of participants for spirometry; however, local guideline recommendations have been followed. Follow-up method for participants may differ depending on participant availability/preference, potentially introducing detection and/or response bias. Sensitivity analyses will be performed where possible to identify any effects of follow-up method on outcomes. Any proposed modifications to the protocol will be approved by the investigator team, before being communicated to relevant parties. Results of the trial will be submitted to peer-reviewed journals, and presented at both national and international research conferences, where possible. BB is supported by an Australian National Health and Medical Research Council Career Development Fellowship (GNT1063206) and a Faculty of Health and Medicine, University of Newcastle Gladys M Brawn Career Development Fellowship. JL is the recipient of the Cyril Tonkin Scholarship 2014 administered by the Victorian College of Pharmacy Foundation Board, Monash University. World Health Organisation. World Health Statistics. Geneva: World Health Organisation, 2008. Australian Institute of Health and Welfare. How many die from COPD? http://www.aihw.gov.au/copd/mortality/ (accessed 3 Aug 2015). Australian Institute of Health and Welfare. What role do hospitals play in treating COPD? http://www.aihw.gov.au/copd/treatment-by-hospitals/ (accessed 3 Aug 2015). Australian Institute of Health and Welfare. What role do GPs play in treating COPD? http://www.aihw.gov.au/copd/treatment-by-gps/ (accessed 3 Aug 2015). Global Initiative for Chronic Obstructive Lung Disease. 2014. GOLD 2014 Global Strategy for the Diagnosis, Management, and Prevention of COPD. http://goldcopd.org/(accessed 6 Jan 2015).
. Not 15 but 50% of smokers develop COPD? - Report from the obstructive lung disease in Northern Sweden studies. Respir Med 2003;97:115–22.
. The COPD-X Plan: Australian and New Zealand guidelines for the management of chronic obstructive pulmonary disease. Australia: Lung Foundation Australia and Thoracic Society of Australia & New Zealand, 2014.
. COPD-X Concise Guide for Primary Care . Brisbane, Australia: Lung Foundation Australia and Thoracic Society of Australia & New Zealand, 2016.
. Management of COPD according to guidelines. A national survey among Belgian physicians. Monaldi Arch Chest Dis 2003;59:62–80. Lung Foundation Australia. 2011. The Australian Lung Foundation position paper on the use of COPD screening devices for targeted COPD case finding in community settings. http://lungfoundation.com.au/wp-content/uploads/2014/02/Position-Paper.pdf (accessed 18 Aug 2015). Access Economics. 2008. Economic impact of COPD and cost effective solutions. http://www.rnig.org.au/docs/EconomicImpactofCOPDandCostEffectiveSolutions-226.pdf (accessed 8 Aug 2015). Reddel H , et al. , Australian Institute of Health and Welfare. 2013. 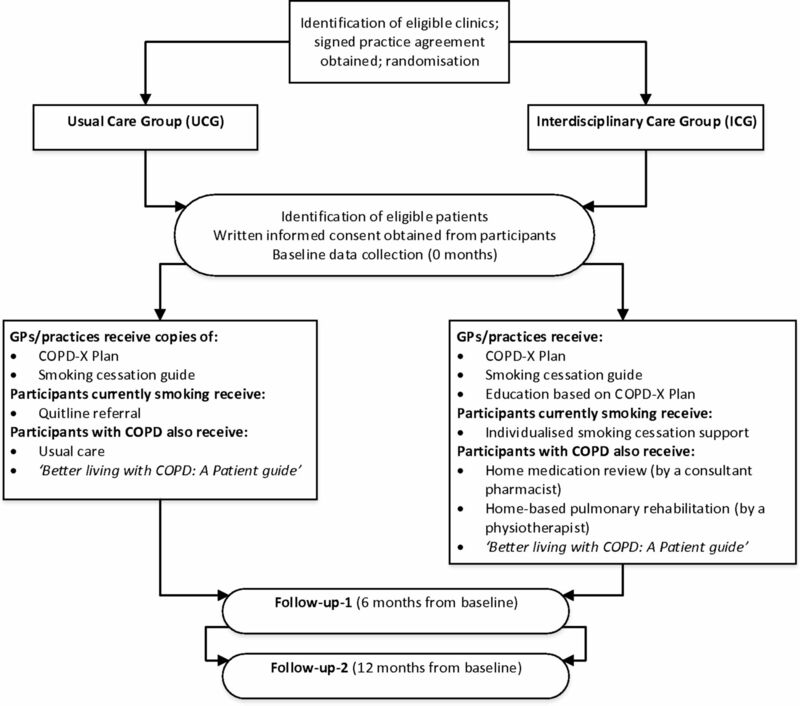 Monitoring pulmonary rehabilitation and long-term oxygen therapy for people with chronic obstructive pulmonary disease (COPD): a discussion paper. Canberra. Australian Institute of Health and Welfare. Cat. no. ACM 29.
. Perceptions of pulmonary rehabilitation by health professionals and culturally and linguistically diverse COPD patients. American Thoracic Society 2013 International Conference. Pennsylvania Convention Centre: American Thoracic Society:A5127–27.
. Integrated disease management interventions for patients with chronic obstructive pulmonary disease. Cochrane Database Syst Rev 2013;10:CD009437. Australian Government Department of Health. 2017. Primary Health Care in Australia. http://www.health.gov.au/internet/publications/publishing.nsf/Content/NPHC-Strategic-Framework~phc-australia (accessed 25 May 2017). Australian Government Department of Human Services. Education guide - chronic disease GP management plans and team care arrangements. 2017 https://www.humanservices.gov.au/health-professionals/enablers/education-guide-chronic-disease-gp-management-plans-and-team-care (accessed 25 May 2017).
. Supporting smoking cessation: a guide for health professionals: The Royal Australian College of General Practitioners, 2011. The Australian Lung Foundation. Better living with chronic obstructive pulmonary disease - a patient guide. 2nd ed. Queensland: The State of Queensland (Queensland Health) and The Australian Lung Foundation, 2012. Pharmaceutical Society of Australia. Guidelines for pharmacists providing Home Medicines Review (HMR) services. 2011.
. Assessment to inform smoking cessation treatment. the tobacco dependence treatment handbook: a guide to best practices. 1st edn. New York: Guilford Press, 2003. Contributors JG conceived the research idea and developed it with input on specific aspects of the project from the other chief investigators, MJA (respiratory medicine), NZ and GR (general practice), AEH (home-based pulmonary rehabilitation), BB (smoking cessation) and AM (health economics). The chief investigators secured research funding in collaboration with BvH, KiP and PE, who are representatives of partner organisations ensuring support for the project and contributing to discussions around implementation of the interventions; they will also play an active role in translation of findings into practice/policy if the interventions are cost-effective. JL and KP are PhD scholars working on the project under the supervision of JG and MJA focusing on the interdisciplinary interventions and diagnostics, respectively. SW was the project manager responsible for recruitment of practices and the overall conduct of the study. EP is the study statistician. All the investigators contributed to all phases of the study, including study design, protocol development and finalisation of manuscript. JL prepared the first draft of the manuscript and revised subsequent versions with input from all authors. All authors have reviewed this manuscript and have approved the final protocol. Funding This trial is funded by the National Health and Medical Research Council (NHMRC) through the NHMRC Partnerships for Better Health – Partnership Projects initiative (APP1076255). Cash and/or in-kind contributions were received from partner organisations: Lung Foundation Australia, Boehringer Ingelheim Pty Ltd and Eastern Melbourne PHN. The LFA and EMPHN were involved in project design and conduct, and will be contributing to data analysis and writing of manuscripts. BI was involved in project discussions, planning and progress review, but had no involvement in the design of the intervention programme and will not be contributing to decisions regarding data analysis and dissemination of findings. Competing interests JG, BB and MJA have held an investigator-initiated grant from Pfizer for unrelated research. MJA has undertaken an unrelated consultancy for AstraZeneca. MJA has received assistance with conference attendance from Boehringer Ingelheim and Sanofi. Patient consent Article does not contain personal medical information about an identifiable living individual that requires the patient’s explicit consent before publication. Ethics approval Monash University Human Research Ethics Committee and La Trobe University Human Ethics Committee.